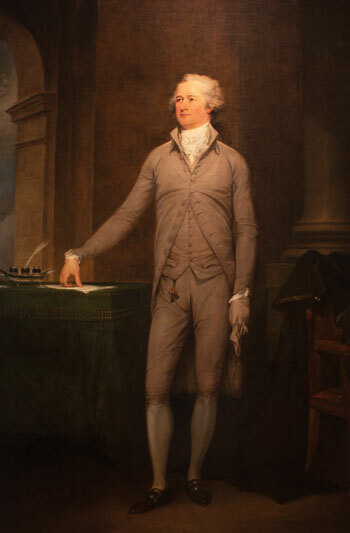 I had blogged earlier about John Trumbull’s iconic portrait of Hamilton, and about plans to house the painting for public display at Crystal Bridges Art Museum of American Art in Bentonville, Arkansas and the Metropolitan Museum of Art in New York City. This week, the portrait was formally unveiled at the Met, so all the NYC Hamiltonians can go take a look at the full-length portrait in person! An iconic life-size portrait by the celebrated Revolutionary-era painter John Trumbull of Alexander Hamilton, then Secretary of the Treasury under President George Washington, is now on view in The American Wing of The Metropolitan Museum of Art. This is the painting’s first showing at the Metropolitan since it was donated, earlier this year, by the global wealth manager and investment bank Credit Suisse to both the Metropolitan Museum in New York and Crystal Bridges Museum of American Art in Bentonville, Arkansas. At the Metropolitan, the work—which is considered the greatest known portrait of Hamilton and one of the finest civic portraits from the Federal period—is on display in Gallery 755, “Faces of the Young Republic,” of the New Galleries for American Paintings, Sculpture, and Decorative Arts among portraits of other great heroes of the post-Revolutionary period.